The Vegan Magpie: Swedish Glace (and turns out Alpro ice cream) offer! Swedish Glace (and turns out Alpro ice cream) offer! EDIT: This offer is also available on Alpro ice creams! I've only just found this out! As of today (11th) I believe it is now only in store as it says it's available for delivery until the 11th, so unless you can get a delivery today, I don't think it counts. Please let me know if I'm mistaken! Thanks. It appears at *the perfect time of the year* Swedish Glace is on offer at Waitrose! 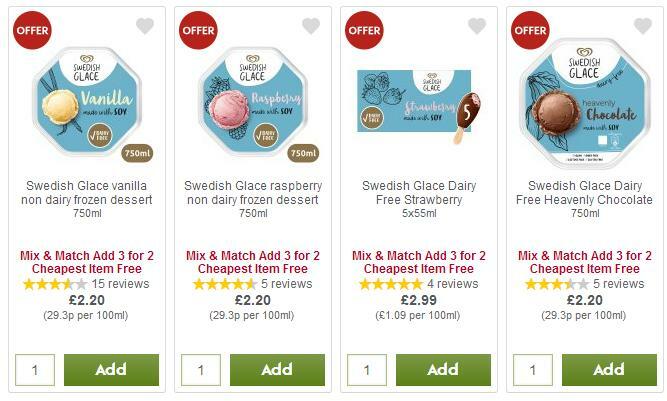 Until the 11th July, Waitrose have put all the Swedish Glace styles that they sell on a 3 for 2 deal. Yum! This is online and instore. What's EVEN more (for some of you) if you have a Lloyds Bank current account, you can activate everyday offers (free) which often has cashback offers on Waitrose purchases. This is sort of random, so don't bank (hahahaha...) on getting this deal, but before you shop it's always worth logging in and checking your offers so you can activate it before you shop! Even without the bonus offers, this is a pretty good deal! Hope this helps.